Advocates of marijuana legalization, emboldened by successes with ballot questions in Colorado and Washington state, are laying the groundwork for such a battle in Massachusetts in the next presidential election year. “In 2016, Massachusetts will find itself in the crosshairs for cannabis reform,” said Allen St. Pierre, the executive director of NORML, a national group that favors the legalization of marijuana. Massachusetts voters passed measures that decriminalized possession of small amounts of the drug in 2008 and allowed its use for medical purposes in 2012 — both with more than 63 percent support. Buoyed by such results, advocates have launched a similar effort to both get a question calling for the drug’s legalization for adults on the 2016 ballot and to raise enough money for victory. But some critics and lawmakers caution that passage is far from guaranteed. Despite its liberal reputation, Massachusetts has a strong traditional strain that will make legal marijuana a tough sell, analysts say. Still, advocates for legalization and analysts expect that public support would be especially potent in a presidential election year, when the electorate tends to include more younger voters. Outside groups are already pledging support — strategic and financial — to push for legalization in Massachusetts. The Marijuana Policy Project, a national nonprofit that says it spent about $2 million on the successful 2012 campaign for legalization in Colorado, also plans to spend money in this state. “We intend to support an initiative in Massachusetts in 2016 that would regulate and tax marijuana like alcohol,” said spokesman Mason Tvert. He declined to attach a specific dollar figure to that effort. Bill Downing, treasurer of Bay State Repeal, a group created to get the legalization question on the ballot, said he expects other national groups to back the effort here. He said a successful bid would need at least a million dollars. Some state political analysts from both parties estimate that, in a presidential year, it will take even more money to sustain a viable campaign. They say the effort will require a minimum of $3 million to $5 million. Even then, they say, perils abound. Still, Gray said, he expects the pro-legalization groups to heavily outspend those opposed to the effort. The ballot initiative is sure to revive familiar arguments, from opponents who worry that children would have easier access to marijuana if it were legal, as well as from supporters who say the drug is already widely available to youths on the black market. While opponents have not formally mobilized, at least one law enforcement group already opposes legalization. 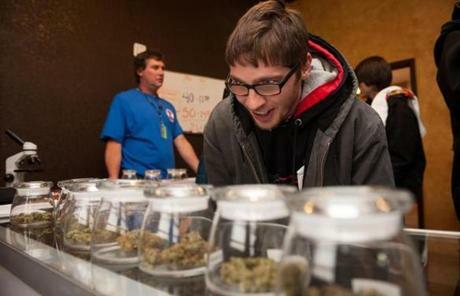 Tyler Williams of Blanchester, Ohio, selected marijuana varieties to buy on New Year’s Day at a dispensary in Denver. Analysts said the initiative’s success will rest on how legalization is framed to voters. Voters in Colorado and Washington were persuaded, approving ballot measures that made marijuana a legal, regulated substance available to people 21 and over. Earlier this month, retail shops opened in Colorado, with shops in Washington expected to begin business later this year. The success or failure of the new laws in those two states during the next two years will affect the fight in this state. Democratic strategist Scott Ferson said he expects public opinion in Massachusetts to be directly tied to how their implementation fares. “Seeing is believing,” he said. Marijuana remains an illegal drug under federal law. The Department of Justice, however, issued guidance last year saying it would take a hands-off approach on prosecution of marijuana cultivation, distribution, and possession in states where those activities were legal and regulated under state law. After legalization in Colorado, existing licensed medical marijuana dispensaries were given preference on retail licenses. If Massachusetts follows that model, as some advocates believe it might, that advantage could prove lucrative to the holders of medical marijuana dispensary licenses here. The 2012 medical marijuana law empowers the Department of Public Health to register up to 35 nonprofit dispensaries, with at least one — but not more than five — in each county. One hundred final-round applications were submitted in November, and the department is set to announce the licensees in a few weeks. O’Keefe, the district attorney who strongly opposes legalization, said passage of such a proposal is far from assured. “I’m not a believer yet that the Massachusetts voter is that gullible,” O’Keefe said.